The 'Boston Tea Party' was a protest in 1773 against British taxation without representation on the American Colonies. However, this iconic rebuffing of excessive British taxes was in fact nothing of the sort. The measures being protested over were injurious all right, but not for the reasons history asks us to remember. 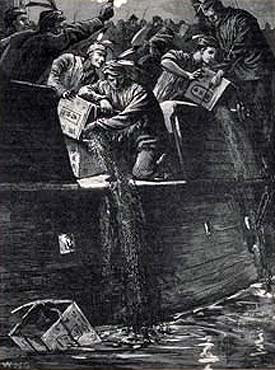 The attack on the tea shipments in Boston harbour was in reaction to the introduction of the Tea Act, by which Britain was seeking to increase tea imports into America to help save the ailing East India Company from bankruptcy. The new Act actually reduced taxes on tea! This was a problem for American traders, as they had profited enormously from smuggling tea in themselves and undercutting the official market where tea sold very expensively due to the customs taxes levied. The Governor of Massachusetts estimated that at the time that five-sixths of all tea consumed within the colony was smuggled. There was so much of the illicit trade going on, and few prosecutions, that engaging in it was regarded less of a serious crime and more as a commercial gamble. By reducing the tax, the British threatened to undermine the lucrative smuggling trade with mountains of cheap legitimate tea. This was why the Bostonians had a problem with it and why they revolted. Post revolution, the story took on a far different and more uplifting patriotic angle.